Notes: Castello Visconteo di Pagazzano is a moated, late-medieval castle located in Pagazzano, a town in the Province of Bergamo in the Italian region of Lombardy.A fortress since prior to the 11th century; however, we have documents about a sortie by a Guelf band that burned the castle and murdered its 200 Ghibelline inhabitants in 1353. The castle and the territory of Gera d’Adda, including Pagazzano, was inherited in 1354 by Bernabò Visconti. The territory was disputed over the centuries by surrounding ruling forces, and various Visconti descendants. 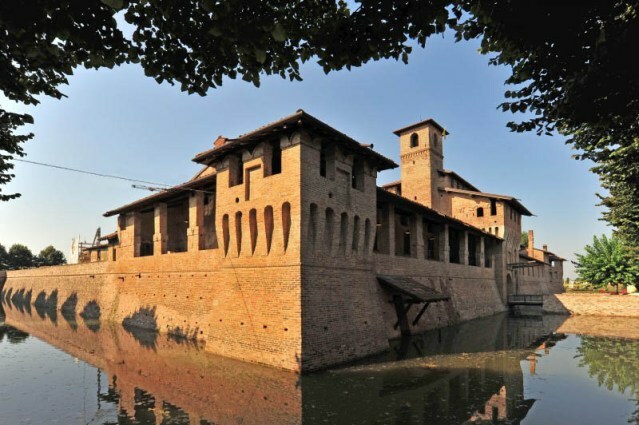 In the 19th century, the castle was owned by the Crivelli family until 1968 when it was bought by a private initiative, and sold to the Comune di Pagazzano in the year 2000.